· Why is the Holy Shroud a scientific object? · What is the Shroud? · How did a chemically-produced image get onto the Shroud from an enveloped dead body? Was the Image made by perspiration, embalming spices, and vapours? Was the Image made by radiation? · Where could the (microwave/proton) radiation come from? · A new binary, world view needed? Variable speed of light (VSL) theories ? ‘Dark matter and dark energy’? Why is the Holy Shroud a Scientific Object? The study of the Shroud involves physics and chemistry because the Shroud is a linen cloth, and, as a physical object, it is subject to scientific, quantitative examination and evaluation. Of course, the Shroud is also of intense interest in many fields of study, such as forensic medicine, art, iconography, archaeology, numismatics, textile science, history, theology and devotional studies, and each of these disciplines has its own methods and standards. If we concentrate here primarily on the physical and chemical aspects of the Holy Shroud, this will in no way question the validity of the other fields of study. What is the Shroud? The Shroud is an ancient piece of yellowed or ivory-coloured linen now in the Royal Palace Chapel in Turin, where it has been kept since 1578 A.D. Previous to that it was in France (1353-1577), Constantinople (944-1204), Edessa (944-40 A.D.), having originated in Jerusalem about 33 A.D. (The Historical Facts). On one side of the cloth only, the Shroud bears the front and back, full length, negative image of the naked body of a dead, scourged crucified man about 5 ft 9 inches tall and weighing about 175 pounds (75 kg.) . The wound marks to the body, wrists, ankles and head match the wounds reported in the four gospels of the New Testament as having been inflicted on Jesus Christ during his crucifixion. The Shroud’s Physical Characteristics. The cloth is a fine linen with a three-to-one herringbone weave. The colour is a very pale ivory-yellow, consistent with its reputed age and history. A detailed discussion of the cloth as a textile is given by Wilson in The Blood and the Shroud . Each thread of the linen consist of a bundle of 80 -100 tiny linen fibrils about one-tenth the thickness of a human hair (i.e. 15 -20 microns, 0.015 -0.020 mm). Linen is nearly 100% cellulose. Cellulose is polycellobiose with the chemical formula (C6H10O5)x . There are 22 triangular patches sewn into the Shroud to cover holes in the Shroud made in a fire in 1532 which took place in the Sainte Chapelle of the castle of Chambery in the French Alps, where the Shroud was kept by the Dukes of Savoy from its acquisition by them from the de Charny family in 1460 A.D. until its final transfer to their Royal Palace in Turin in 1578 A.D. There is a backing cloth - the so-called Holland cloth -which was sewn onto the back side or non-image side of the Shroud by the Poor Clare nuns who repaired it after the 1532 fire to help strengthen and preserve it. In 2002 this backing cloth and the 22 triangular patches, were replaced at Turin in the first major repair since the fire at Chambery . The specific weight, unit weight or area-density of the linen, ( that is the weight per unit area ) is about 23 milligrams per square centimeter , so that the Shroud as a whole would weigh 436 x 110 x 23 x 10-6 = 1.1 kilograms. (This ‘specific weight’ or ‘unit weight’ measurement is an important one in calculating the possible contamination of the radiocarbon dating samples cut in 1988 from a heavily handled corner of the Shroud, since these samples averaged 42.9 mg/sq.cm, in weight, instead of the 23 mg/sq. cm. for the rest of the Shroud, thereby showing a contamination of the test samples of about 87% ( 42.9/23) = 1.87 (See Carbon 14 dating ). The. physical qualities of the linen and the image it bears have been studied optically, by spectral reflectance, infrared and X ray reflectance, X-ray fluorescence, and by many other scientific techniques [4,5,6,7,8,9]. There are two main types of markings on the Shroud, namely the negative image of the body, and many bloodstains. There are also a number of water stains on the cloth made by the water used to douse the 1532 fire at Chambery. (Other websites are to be found in various search engines such as Google, Scirus, AltaVista, etc. As seen by the naked eye, and in a photographic positive, the image of the body of The Man in the Shroud appears as a faint, pale brownish, or pale sepia coloring on the ivory-yellow linen cloth. This image is on one side only of the cloth; it shows the full length, front and back image of a dead man, as though the corpus had been laid out on the extended cloth, which was then folded back over the head to fully envelope or enshroud it in the tomb. The image has a negative character, since prominent body features such as the forehead, tip of the nose, chin, chest, forearms, hands and knees, which would be closest to the enveloping shroud, show up as the darkest shadings of sepia, while recessed body areas such the eye sockets, neck, pelvis, and ankles are lightest. This negative aspect was first discovered when Secundo Pia took the first photograph of the Shroud in 1898. To his amazement, the photographic negative came out of the developing bath as a positive image. This astounded the scientific world of the time and launched the scientific and scholarly efforts of the past century. The hair and beard are visible as well as the flesh areas of the body. There are faint indications that some deeper parts of the body are imprinted in the image, such as the bones of the fingers and the teeth sockets, in a manner somewhat reminiscent of an X-ray. The image is sharply truncated or cut off at the sides of the face and body. That is to say, if the image is envisaged as having been formed by a stream of light photons, or other radiation, then the radiation must have been strictly up and down, parallel to the earth’s gravity, since there is no image of the sides of the face, or the sides of the torso or limbs, or of the top of the head. Under the microscope, the sepia coloured image on the Shroud appears made up, not of a continuous shading, but of tiny, discrete segments of straw-yellow color along the individual linen fibrils in the image area. The color is confined to the topmost fibrils in each linen thread, with the underlying fibrils and threads being uncolored. The colored segments, or image ‘pixels’as they are now commonly called, are 200 to 1000 microns in length ( i.e. 0.2 to 1 millimeter). In the areas where the image is darkest, the pixels are closely spaced; in the lighter areas, they are spaced farther apart. In this way, the Shroud image resembles a half-tone photo print made up of tiny print dots all of the same shading or hue, and where it is only the variable spacing or area-density of the print dots that causes the light and dark shadings which form the photo image. The image is very superficial, residing only on the topmost threads and fibrils of the linen on the inner side of the Shroud next to the body, with no image on the reverse or outer side of the Shroud. The coloured image pixels have sharply terminated ends along each fibril; that is, they do not just fade out but have clear cut ends . Any theory of image formation must explain these characteristics of the individual image pixels. There are burn areas on the Shroud near the patches from the 1532 fire at Chambery, and they fluoresce under ultraviolet light as does any linen that has been scorched or charred. However, the Shroud image areas do not fluoresce under ultraviolet light, which shows that the Shroud image was not produced by a simple scorching of the linen. Unlike the image features, which are negative, with lights and darks as seen by the eye being reversed in the photograph, the blood and wound markings photograph just as they are seen by the eye. Detailed forensic and medical studies over decades show that the Man in the Shroud was dead, but that there had been no decomposition of the body. The blood stains and blood flows are consistent with those to be expected from a scourging and crucifixion. The stains on the Shroud from the wounds have been shown to be human blood of Type AB. The blood content of bilirubin is very high as would be the result of extreme pain and trauma. The principal wound marks are: about 120 scourge marks which match those that would be made by a Roman flagellum; the wrists and feet are pierced by marks corresponding to the nailing of a crucifixion; there are skin abrasion wounds along the upper back and shoulders which would match those from carrying a heavy burden; there is a circlet of head wounds which would match those from a crown of thorns; there is a large wound in the side of the chest which would correspond to that resulting from the thrust of a spear. The blood and serum flows from the chest wound indicate that the victim was dead when the image on it was made. All of these wound details correspond to the descriptions of the passion and death of Christ in the New Testament. The blood stains from the wounds were not disturbed by whatever process took place in the formation of the image, nor by whatever process occurred when the Shroud was separated from the enclosed dead, un-decomposed body that it had enveloped that is to say, there is no sign of the blood clots having been disturbed or pulled apart. There is no image on the linen beneath the blood stains. There are many other forensic and medical details that are important, but special treatises should be consulted. (e.g. Barbet, Bucklin, Lavoie et al., Baima Ballone et al., [12,13,14,15] ). Samplings of particulate matter on the Shroud by Frei  have shown the presence of pollen , spores, bacteria and mineral dusts. These are consistent with a conclusion that the Shroud during its history has been in France, Turkey, and in Palestine at the Passover time of the year. On the feet, knees and the nose are found particles of the travertine aragonite (limestone) dust which also occurs in the Jerusalem area. The eye areas of the image on the Shroud show two small, round, button-like objects on which have been found parts of the Greek inscriptions of the lepton coins of Pontius Pilate, issued by him in Jerusalem around 29 to 30 A.D. 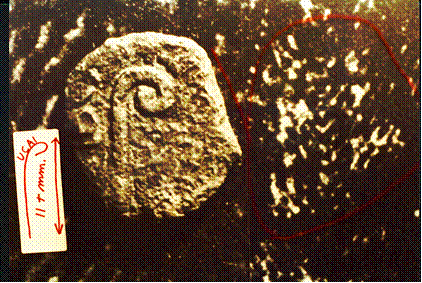 The presence of these coin-like objects was discovered by Jackson, Jumper et al. of STURP . Shortly thereafter, the identification of the objects as lepton coins issued by Pilate was made by Fr. Francis Filas S.J, [18,19]. Further verification of the coin findings has been made by M. Moroni  and by P.L. Baima Bollone/N.Balossino . Other studies of coin images and possible other markings on the Shroud have been made by A. Whanger . The presence of these coin images support a date of origin for the Shroud image to the era of the crucifixion of Christ. Their importance was generally downplayed in the 1980’s, apparently because it was felt by some that their existence would weaken the pressure then being exerted to permit a carbon-14 dating of the Shroud. There are hundreds of these lepton coins of Pontius Pilate extant today. 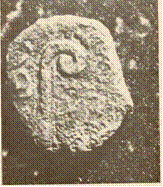 They show a curved astrologers staff or lituus together with the curving Imperial Greek inscription IOU KAICAPOC, which is a shortened form of the full title, TIBEPIOU KAICAPOC (‘Tiberias Caesar’). Sometimes the inscription appears with a C instead of K, for example as CAICAPOC. On the Shroud photographs Filas discovered the curving letters UCAI of the inscription together with the lituus. The markings are more clearly seen on second and third negative off-prints, apparently because the interfering weave pattern of the linen of the Shroud becomes progressively suppressed. The physical means by which images of metal coins could have become imaged on the Shroud, as well as the images from organic elements such as flesh, hair, and blood is clearly important for any fundamental explanation of the image mechanism. It was Paul Vignon  who first noted that the darkness or lightness of the image seemed to be related to how close or how far the particular image area would have been from a body enveloped in the cloth. [Figure 1]. This is the famous three dimensional quality of the image that was firmly established on a quantitative basis by the STURP scientists, especially by Jackson, Jumper, Ercoline and German. [22, 23, 24]. This then means that the closeness of spacing of the image elements or pixels on the cloth varies quantitatively with the distance of the linen Shroud from the enveloped body [ Fig.1]. We shall return to this 3-dimensional problem when we investigate how the image got onto the cloth in the first place - in all probability by some sort of radiation which drops off in intensity with distance from the body by being absorbed or attenuated in the air gap between body and Shroud. Before we discuss image-transfer theories, that is, how the image got from the enclosed dead body of The Man in the Shroud to the cloth itself, let us set out the now well-established chemical characteristics of the image on the Shroud. What is the image chemically? The image consists of separate, tiny, straw-yellow coloured image elements or image ‘pixels’ along individual linen fibrils. The fibrils themselves are around 15 to 20 microns in diameter. The coloured pixels range in length along the fibrils from about 200 microns to around 1000 microns.. The mage pixels are abruptly terminated on the fibrils, that is to say , they have sharp beginning and ending boundaries; they do not fade out gradually but start and end at full colour. The pixels occur only on the topmost fibrils of the top linen threads on the image side of the Shroud, so that the image is extremely superficial on the linen. The threads and fibrils that are deeper into the weave are colourless. Where one image fibril crosses over another fibril the undermost fibril is colourless. Thus the image mechanism does not penetrate the cloth or the individual threads. It is a ‘top-of-the-topmost-threads-only’ mechanism. The intensity of hue of the individual image pixels is always the same. It is only the closeness or spacing of the individual pixels that causes the variation in the image shading from light to dark image areas. Thus the chemical, process is very uniform and abrupt, and moreover is not continuous along any fibril, but is always quantified into discrete lengths of 200 -1000 microns. There is no variation of pixel hue on the underside of the body image where the weight of the body would be pressing down on the Shroud, as compared to the top image; thus the individual image elements or pixels are of the same intensity regardless of the contact pressure of the body against the cloth as compared with areas where there is no contact and where there is an air gap between the body and the enveloping Shroud. Since the individual pixel hue is always the same, regardless of separation or contact pressure, then clearly the chemical process involved in image formation is a very precise one. Linen is a cellulose fibre from the flax plant. Cellulose is polycellobiose with the chemical formula (C6H10O5)x . Its gram-molecular weight is 162.14. The scientific consensus today is that the image on the Shroud is fundamentally due to a chemical discoloration of the cellulose fibrils of the linen in each tiny image element or ‘pixel’. This chemical change is technically called an acid -oxidation of the cellulose fibrils to produce the straw-yellow chromophore groups –C=O- which color the individual pixels. While to the eye the colour of the image areas is sepia or pale brownish, under the microscope the colour in the individual image elements or pixels is straw-yellow. This chemical process for forming the straw-yellow colour of the pixels on the fibrils was first established by Heller and Adler  ; a recent summary is by Moran and Fanti . How did this chemically-produced image get transferred onto the Shroud from the enveloped dead body in the cloth? · Was the Shroud image made by an artist? The ‘painting fraud’ theory. The ‘renaissance genius’ fantasy. · Was the image made by photographic means? · Was the image made by perspiration and vapors from spices? The Vignon vaporgraph theory. · Was the image made by some sort of radiation? The thermal degradation of cellulose theory. It must be kept in mind that any image formation theory must be judged today, not only by its ability to explain one, or a few, or many, of the image characteristics, but also in the light of the great mass of evidence for the Shroud’s authenticity that has accumulated over a century of serious, dedicated scholarly and scientific research as outlined above. No fraud theory can face this weight of evidence; consequently fraud theories today are of minor interest. They will be outlined here only for background information. Painting requires paints, that is pigments of various colours dispersed in a painting medium such as oil, tempera, casein, water etc. Then, the paint is applied to the support cloth , canvas, paper etc. usually by a brush or knife which always leave characteristic marks. The shadings or values of the painting which give it its depth and realism are made by applying lighter or darker values of the pigment. Paintings are positive images, that is, shadows and recesses are darker and prominent features are lighters in value. The shroud image is a negative, with reversed black and white values. It could not have been painted before the knowledge of negative images became known in the middle of the 19th century when black and white photography was discovered. Conclusively, there are no paint pigments, no paint medium ( oil, egg tempera, casein, etc,) nor any brush marks on the Shroud. Therefore the Shroud image is not a painting of any kind. The only serious proponent of this painting forgery theory was the late Walter McCrone who was reputable in the field of microscopic chemical identification of minerals, dust particles, chemicals and other substances found on objects. He claimed to have found iron oxide on the Shroud, along with traces of vermilion which is used in paints. The miniscule vermilion specks are today considered to be entirely irrelevant, and to have come from inadvertent contamination by various artists who painted copies of the Shroud over the centuries. In spite of the fact that all the other evidence was missing - that is to say, no shading of iron oxide, no paint medium, no brush marks and so on - McCrone still strenuously proclaimed his view that the Shroud was a painted hoax. Heller and Adler  soon demonstrated that the iron oxide was not outside on the linen fibrils as in paintings but inside the cellulose fibrils themselves, and that this was due to the traditional retting process of making the linen from the flax plant by soaking it for days in ponds or streams where it chemically absorbs iron, strontium, calcium, potassium and many other water soluble minerals into the cellulose pores. McCrone refused to consider their evidence and eventually became isolated from serious work on the matter. His assertions are still circulated by mass media interests, but not in serious work. Many professional artists such as Picek  have also discussed the technical incompatibility of various painting techniques with the Shroud’s image characteristics. In spite of this, however, presentations are occasionally still made presenting someone such as Leonardo da Vinci as the ‘genius Renaissance art forger’ of the Shroud. Such claims are mere propaganda or sensational exploitation of his reputation. Again, it must be pointed out that, even if an actual convincing demonstration that a negative shroud-like image could be painted, it would still be irrelevant to the Shroud’s authenticity as the true shroud of Christ, since it would be contradicted and refuted by the mass of other evidence for authenticity which it can not explain. Painting forgery theories of Shroud image formation today are therefore unacceptable. Was the Shroud image made by photographic means? Since the Shroud and its image are now securely dated historically to the 1300’s in Europe, and to the years from 1204 to 944 in Constantinople, and to Edessa prior to 944, the argument that a negative photograph could have been fraudulently imprinted on cloth many centuries before the invention of photography is not worth discussion. This theory originated from the observation that image on the linen has many of the characteristics in hue and shading that a thermal scorch on linen can produce. Consequently it was theorized by Ashe  and others that if a linen cloth were to be draped over a metal effigy heated to 250 deg. C ( which is about the scorch temperature threshold for linen) then the image could have been produced. Since the draped cloth would have various air gap distances between statue and the cloth draped over it, and since thermal radiation is attenuated in air to some degree as it passes across the air gap, then some three dimensional information might be transferred to the cloth, points closest to the statue being more scorched than those farther away. However, thermal radiation spreads out widely, and so would not give the required definition to the image features. In addition, the attenuation rates, or the drop off in radiation intensity with distance traveled through air, could not match those observed on the Shroud image. Furthermore, a true scorch also causes linen to fluoresce under ultraviolet or X-ray examination. But the STURP team of investigators who examined the Shroud in 1978 found that, although the burnt patches on the Shroud from the 1552 fire did fluoresce as expected, the image areas showed no signs of fluorescence at all [6,8,9]. Therefore, the image on the Shroud was not made by a thermal scorch. Although, since it is a ‘fraud theory’ , the hot statue theory is today untenable against the accumulated evidence for authenticity, it has been historically very useful because it proposed a chemical degradation of the cellulose, and so spurred investigation of an essential ingredient of any plausible image formation theory. Today there are only two serious scientific theories for chemically altering the Shroud’s cellulose and producing the observed image. First, there is the complex vaporgraph hypothesis, which involves contact, vapour diffusion, chemical catalysis, heat and ageing. Apart from being very involved and complex, this theory cannot meet many of the essential image requirements. Second, there is the radiation hypothesis which meets all the image characteristics, is intrinsically simple, but which then raises very difficult questions with regard to the origin of the image-forming radiation. 1. Was the Shroud image made by a vaporgraphic process? Vignon  presented this, the first scientific attempt to explain the physical and chemical processes by which the image might have been imprinted on the Shroud by a natural process. He theorized that a body in pain produces perspiration containing urea, and that urea may chemically change to produce ammonia. Then he reasoned that the embalming spices myrrh and aloes mentioned in the Gospel of John ( 19:38-41) as having been placed in the tomb at the burial of Christ, could have reacted with ammonia from perspiration to produce the observed brownish or sepia coloring of the linen in its image areas. Those areas of the body nearest to the cloth, Vignon reasoned, would have had the darkest image, and vice versa. This would roughly account for the observed negative nature of the Shroud image. Vignon’s ingenious theory was soon found to have various untenable features. The diffusion of vapours could not have produced the necessary sharpness of definition of the Shroud image. Also, diffusing vapours would permeate the fibrils, whereas the Shroud image is only on the topmost fibrils of the inner side of the cloth and does not penetrate into the linen as would have been the case with a diffusion process. His theory, however, does not explain how the image discolourations could be made to vary so as to match the three dimensional image feature of the Shroud, nor to reproduce its observed fine optical resolution. The main value of this theory is again to focus attention on the chemical alteration of the cellulose as being the source of the image on the cloth. As a transfer theory it fails because only radiation transfer with its attenuation in an air gap can fully account for the three-dimensionality of the image. It also could not produce the discrete, sharply terminated image pixel lengths that are observed. Radiation with wavelength shorter than 340 nm (3.4 x 10-9 m), such as X-rays and energetic ultraviolet radiation, can directly degrade cellulose. However, radiation of such short wavelength is also so energetic that it not only chemically produces chromophore rearrangement, but at the same time also pyrolizes or explosively disrupts the cellulose of the linen and thereby alters its appearance and colour. 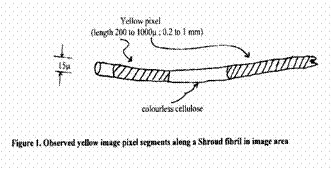 This rules out the action of energetic, short wavelength radiation as an image transfer means, since the Shroud image areas shows only the chemical alteration of the cellulose to the pale straw-yellow colour but no fibril damage. Longer wavelength, that is to say, weaker radiation, (visible light, infrared, microwave) does not cause any damage to linen, but does cause the needed colour change which forms the observed image. However it is energetically quite weak and can not directly affect the cloth except over very long times of exposure. Moreover, radiation would penetrate the threads and fibrils to color them interiorly which is not observed. Consequently, even long wave radiation, which is is a candidate because it is energetically suitable, still requires some indirect mechanism of energy absorption which (1) raises the temperature at the surface of the cellulose fibrils to 200 to 300 C, but not high enough to damage the cellulose or pyrolize it, and (2) this indirect mechanism would also have to correctly produce the observed discrete, separated pixels having the observed lengths of 200 to 1000 microns, and which, moreover, must be abruptly terminated at each end as mentioned above. The various types of radiation are listed in Table 1 together with their effect on cellulose. The strength or intensity of the Shroud image at each point on the cloth was studied intensively in 1977 by the STURP team and again in 1978-82 [17,22,23,24]. Their data have been analysed by Power [29,30,31,32] and are graphed in Figure 1and 2. below. where I0 is the initial radiation intensity presumably from the enclosed body, I is the radiation intensity after traveling a distance x across the air gap between the body and the Shroud, and k is the ‘attenuation constant’ which depends on the nature of the radiation and the nature of the material through the radiation is traveling. Here we are concerned only with attenuation in moist air. The air gap distance x is shown in Figure 1. The observed Shroud image intensities, the attenuation of radiation intensity across the air gap distance x, and several possible curves to fit the data are shown in Figure 2. We see that greatest intensity image points on the Shroud ( I/Io nearest to 1) occur at separations (x) of less than half a centimeter between cloth and body, for example at the forehead, tip of the nose, hands and knees. Lower intensity images ( I/Io < 0.5 ) occur at distances from 1 cm out to 6-9 cm. such as at the eye sockets, neck and ankles. Microwave radiation, because it has the required attenuation in air, could transfer image information by an attenuated intensity flow from body to cloth. But, does microwave radiation also have sufficient energy to cause the necessary chemical alteration of cellulose to form the image? Power  estimated the energy required to degrade cellulose thermally and found it to be about 286 Joules of energy per gram of linen fibrils chemically altered to form the molecular chromophores –C = O- that make up the straw-yellow image pixels. This relatively small energy is well within the range of energies of a microwave flow. However, this small amount of energy must also be able to couple to the cellulose in such a manner as not only to produce the straw-yellow colour, but to do so in the observed discrete sizes of the image ‘pixels’, and also to affect only the topmost fibrils on the topmost threads of the linen. This combination of requirements is quite demanding for any theory. To repeat, in addition to fitting the attenuation requirement and having the necessary energy, a candidate type of radiation must be able (1) to act chemically on the linen and produce the pixels of the yellow colouring, with no explosive or pyrolitic damage, and 2) the pixels produced by the radiation on the fibrils must be 200 to 1000 microns long and abruptly terminated at each end. No type of radiation can do all this by direct absorption, since any radiation will penetrate to some extent into the threads and discolour the inner fibrils, and this is not observed. However, microwave radiation because of its ability to heat water efficiently can meet the requirements by being absorbed, not directly by the linen, but by being absorbed by micro-droplets of water condensed onto micro-crystals of various common mineral salts which are know to be present on the Shroud. The microwave radiation heats the micro-droplets of water to form superheated steam droplets which then catalyzes the necessary chemical change in the cellulose to form the individual straw-yellow image pixels in the proper size range, Power (35). 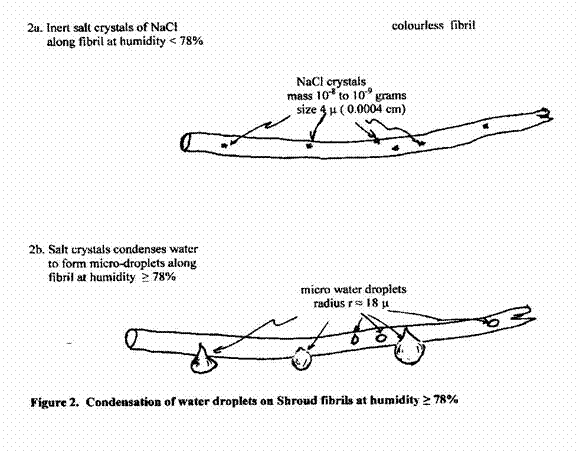 Figure 2. depicts how high humidity ( >78%)- such as would necessarily prevail initially in the air gap between the Shroud and the enveloped dead body- would automatically form condensed micro-sized water droplets onto micro-crystals of mineral salts known to be present in copious amounts on the Shroud . Microwave radiation impinging on the micro-droplets will heat them and form superheated steam cloudlets with temperatures of above 200 degrees, which is the minimum temperature needed to quickly degrade cellulose to form the yellow pixels. Superheated steam immediately causes the formation of the chromophore bond ( -C=O-) to produce the straw-yellow spots or ‘image pixels’ on the cellulose fibrils, in the proper observed lengths ( 200 to 1000 microns ; 0.2 to 1 mm), and with their observed abrupt ends at the boundary of each separate steam cloudlet (Fig. 3), R. N. Rogers  and Power . Conclusions from the Scientific Facts as to the nature of the image on the Shroud and the means of image transfer to the cloth from the enveloped Body of the Man in the Shroud. 1. The image on the Shroud is a result of a chemical alteration of the cellulose of the linen cloth brought about by a natural energetic means and not by any human action or forgery. The specific chemical reaction is an acid, dehydrative oxidation of the cellulose to form conjugated –C=O- structures which produce the observed straw- yellow colour of the image elements or ‘pixels’. 2. The natural energetic means that brought about the chemical alteration, and the image transfer means that carried the three-dimensional image from the body to the linen cloth, are consistent with a predominantly low-energy radiation in the microwave region at a wavelength of 0.3 to 1 millimeter (Power . Supplemenetary proton/ neutron radiation proposed by Rinaudo  may also be involved in the formation of some subsidiary features of the Shroud image, such as the image of Roman coins over the eyes, and the faint X-ray character of some body features of the fingers and the jaw, and possibly in some minor enhancement of the carbon-14 content of the cloth. 3. The Scientific Facts together with the Historical Facts point overwhelmingly to the authenticity of the Holy Shroud of Turin being that of Christ and bearing His image. The level of proof is certainly well beyond a judicial court’s ‘preponderance of evidence’ criterion of proof, and approaches or exceeds that of ‘beyond reasonable doubt’. The same level of confidence applies to the scientific consensus on the chemical nature of the image. 4. The theory of the image transfer process by some sort of radiation is presently still at the lower level of proof of ‘preponderance of the evidence’. 5. There is currently no scientific consensus at all on the precise nature and source of the image-transferring radiation. The next step is to try and formulate a physical theory which can reasonably (and preferably eventually experimentally) demonstrate the nature and source of the radiation which transferred the energy which imprinted the observed image of Christ on the Shroud. Where did the (microwave) radiation that formed the image on the Shroud come from? The central problem here is this: To form the observed image on the Shroud, the present scientific evidence indicates that radiation would have had to emanate from within the dead body of the Man in the Shroud. But, radiation does not come from dead bodies. Therefore, such image forming radiation, if it occurred, must have been due to been an extraordinary event. Some researchers on the Shroud who believe that the image was formed in connection with the Resurrection of Christ have suggested that some ‘burst of radiation’ occurred , but no plausible physically based explanation for such an extraordinary radiation event has been put forward. Most scientific researchers, indeed, have preferred to keep away from any ultimate aspect of the problem as long as possible and to concentrate on the details of the image which can be studied scientifically. Our position here is that any ultimate question for science may still be premature. This is because there now exist several new scientific approaches which it appears may eventually offer a scientific explanation, although not an ultimate reason of course, for the extraordinary generation of the necessary image-forming radiation. 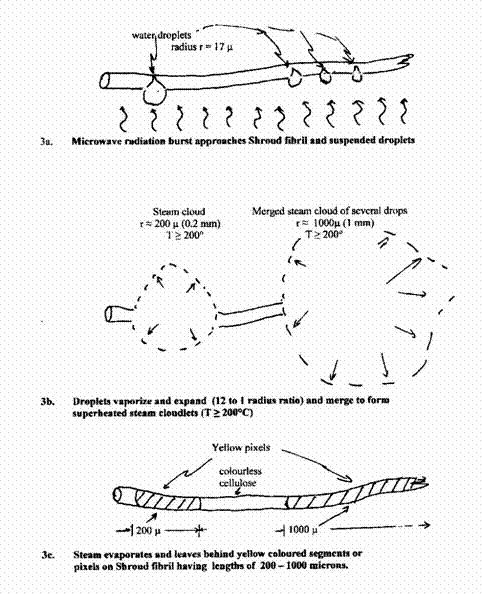 These new approaches are (a) various variable speed of light (VSL) theories [37-42], and (b) the exploration of the application of negative pressure-energy flow models to astrophysical problems..
where c is the variable speed of light, co is the constant or static speed of light in space ( 3 x 108 m/s) in the absence of any relative flow V, and n is the number of ways the energy of the compressible flow is divided. The flow is understood to be for unit mass, so that mass does not appear explicitly. 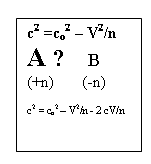 In this equation the wave speed c decreases from the maximum static wave speed value co as V increases and reaches zero at a maximum flow escape speed to a vacuum, Vmax = n1/2 co. This maximum flow speed is superluminal in all cases for n greater than 1.
where the bracketed expression is the familiar contraction factor. c2 = co2 – V2/n – 2cV/n. In all known material gases n is a positive integer, but the possibility of it being, alternatively, a negative number, either integral or fractional, raises the possibility of a binary, evolving universe encompassing both our ordinary, condensed energy matter and the astronomical ‘dark matter’. Where n = 2/(k-1) ; k = (n+2)/n = γ = cp/cv ,the ratio of specific heats of the fluid. As in the energy equation, n and k can be either positive or negative. Positive n values correspond to all know material gases where compression waves are the rule and wave speeds are equal to or less than the static wave speed co (World A). Negative values of n (World B) yield hypothetical exotic fluids where k can be variously positive or negative. Rarefaction waves are the rule. Here wave speeds are always superluminal , that is c is greater than the static wave speed co. In 1999 the discovery of anomalous redshifts in the cosmic microwave background CMB by Bachall, Ostriker, Perlmutter and Steinhardt  was interpreted to mean an accelerating expansion of the universe under the influence of an anomalous ‘negative pressure energy’, which was called ‘ dark energy’. The proposal of Kamenshchick, Moschella and Pasquier [46,] that the dark matter and dark energy can both be related to the so-called Chaplygin gas, also called the ‘tangent gas’ in aerodynamic theory [43, 44], has now opened the door to widespread active investigation of the suggested involvement of negative-n states with dark matter and dark energy. 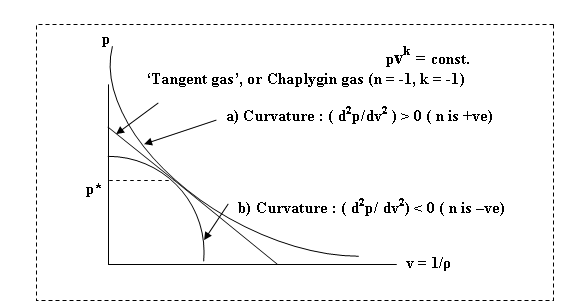 Since the Chaplygin gas curve has negative n (unlike the asymptotic World A isentropes ( a) where n is positive) it intersects the v axis. Therefore, negative pressures can be experienced, and it is this property that is used to explain the observed anomalous red-shift currently interpreted as being an accelerated expansion of the universe . At the present time extensive investigation is continuing into this new possibility [ e.g. 47,48]. This new World B physical and astrophysical theory will be outlined in future Updates to the Website in the context of its application to the problem of image forming radiation for the Holy Shroud . 2. Mechthild Flury-Lemburg, Sindone 2002 . L’intervento conservatio. ( The Shroud 2002. Intervention for Conservation). Publishing House for the Diocese of Turin (ODPF) 2003. (www.sindone.org/). 3. A. Timossi, La S. Sindone nella sua Contituzione Tessile. Torino, 1933. 4. Proceedings of the 1977 United States Conference of Research on the Shroud of Turin. March 23-24, 1977. Albuquerque, New Mexico. Published by: The Holy Shroud Guild, 294 East 150th Street, Bronx, N.Y., 10451 (http://www.shroud.org/). 5. Eric Jumper and Robert W. Mottern, Scientific Investigation of the Shroud of Turin. J. Applied Optics. 19, 12, p 1909, June 15, 1980. 6. S.F. Pellicori, Spectral Properties of the Shroud of Turin, J. Applied Optics. 19, 12, p 1913, June 15, 1980. 7. J.S. Acetta and J. Stephen Baumgart, Infrared reflectance spectroscopy and thermographic investigations of The Shroud of Turin. J. Applied Optics. 19, 12, p 1921, June 15, 1980. 8. Roger Gilbert Jr., and Marion M Gilbert, Ultraviolet-visible reflectance and fluorescence spectra of the the Shroud of Turin. J. Applied Optics. 19, 12, p 1930, June 15, 1980. 9. R.A. Morris, L.A. Schwalbe and J.R. London, X-Ray Fluorescence Investigation of the Shroud of Turin. X-ray Spectrophotometry, 9, 2, p. 40, 1980. 10. Gino Moretto, The Shroud: A Guide ( English transl.). Paulist Press, New York, N.Y. 1996. 11. Kevin E. Moran, Optically Terminated Image Pixels Observed on Frei 1978 Samples. Intnl. Research Conference “Multi-disciplinary Investigation of an Enigma”, Richmond, Virginia, 18-20 June, 1999. 12. Pierre Barbet, La Passion et la Mort de N.S. Jesus-Christ Selon le Chirugien. Paris. Dillon & Co. 1950. ----------------------, A Doctor at Calvary. Image Books, N.Y. 1963. 13. Robert Bucklin, M.D, The Medical Aspects of the Crucifixion of Christ. Sindon, 7, 1961, pp.5-11. 15. Pier Baima Bollone, M. Jorio, and A.L. Massaro, La demonstrazione della prezensa di trace di sangue umano sulla Sindone. Sindon 30, 1981, pp 5-8. 16. Max Frei, Nine years of palynological studies on the Shroud. Shroud Spectrum Intnl. 3, 1982, pp 3-7. 18. Francis Filas, S.J., The dating of the Shroud of Turin from coins of Pontius Pilate. 1982. Cogan Productions, A division of ACTA Foundation, 11134 Youngstown Ave., Youngstown, Arizona 85363. 19.---------------, What are the Facts about the Shroud of Turin?. Messenger, 91, 4, April 1981 pp. 12-16. ( Canadian Messenger. 661 Greenwood Ave. Toronto, ON, M4J 4B3). 21. Paul Vignon, The Shroud of Christ. Constable, London. 1902. 22 .John P. Jackson, E.J. Jumper and W. Ercoline. 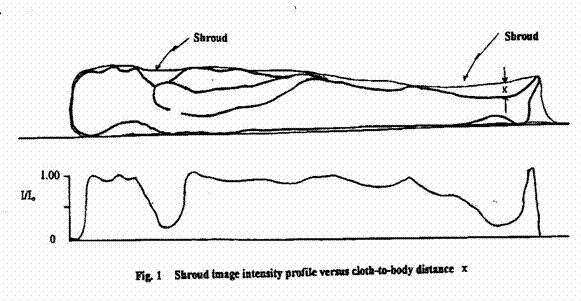 The Three-dimensional Characteristics of the Shroud Image. Proceedings of the 1982 IEEE International Conference on Cybernetics and Society. Seattle. Oct. 28-30 1982. 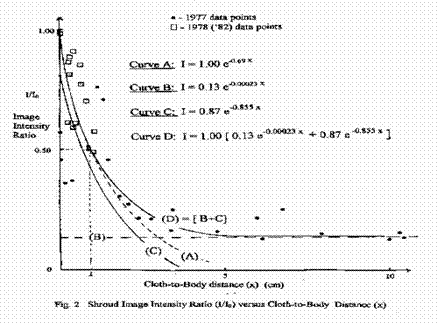 23.------------ Correlation of image intensity on the Turin Shroud with the 3-D structure of a human body shape. Applied Optics 23 July 1984, pp. 2244-70. 25. John H. Heller and Alan D. Adler, A Chemical Investigation of the Shroud of Turin. Can . Soc.. Forensic Sci. J. 14, 3 pp-81- 103, 1981. 26 Kevin Moran and Giulio Fanti, Does the Shroud body image show any physical evidence of Resurrection? IV Symposium Scientifique International du CIELT. Paris, 25-26 Avril 2002. 27. Isabel Piczek, Why the Shroud of Turin could not have been the work of a clever artist. Los Angeles, Private publication, 1989. ---------------------, The Shroud of Turin according to the Professional Arts: Why it cannot be a painting. Private publication, 1991. 28. Geoffrey Ashe, What Sort of Picture? Sindon pp. 15-19, 1966. 29. Bernard A. Power, Il Meccanismo di Formazione dell’Immagine dela Sindon di Torino, Collegamento pro Sindone, Roma, Maggio-Giugno, pp 13-28, 1997. 30.------------------------, Caratterizzazione di una Lunghezza d’Onda per la Radiazione che Potrebe aver Creato I’Immagine Della Sindone di Torino. Collegamento pro Sindone, Roma. Novembre-Decembre, pp. 26-36, 1999. 31. -----------------------, An Unexpected Consequence of Radiation Theories of Image formation for the Shroud of Turin. Proc. Worldwide Congress Sindone 2000, Orvieto, Italy, Aug. 27-29, 2000. 32. -----------------------, Image Formation on the Holy Shroud of Turin by Attenuation of Radiation in Air. Collegamento pro Sindone website (www.shroud.it/) March 2002. 33. J. B Rinaudo, Image formation on the Shroud of Turin explained by a protonic model affecting radiocarbon dating. 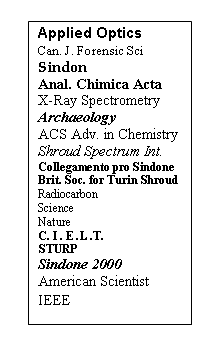 III Congresso internazionale di studi sulla Sindone, Torino, 5-7 Giugno 1998. 36. Kenneth E. Stevenson and Gary H. Habermas, Verdict on the Shroud, Servant Boks, Ann Arbor , Michigan, 1981. 37. John D. Barrow, and J. Magueijo, Phys. Rev. Lett. B 443, 104-110, 1998. 38. Donam Youm, Variable–speed-of-light cosmology and second law of thermodynamics. Physical Review D., 66, 043506, 15 Aug. 2002. 39. John D. Barrow, Variations of alpha in space and time. Phys. Rev. D. 043515, 15Aug. 2002. 40. Bernard A. Power, Shock Waves in a Photon Gas. Contr. Paper No. 203, American Association for the Advancement of Science, Ann. Meeting, Toronto, Jan. 1981. 41. -----------------------, Unification of Forces and Particle Production at an Oblique Radiation Shock Front. Contr. Paper N0. 462. American Association for the Advancement of Science, Ann. Meeting, Washington, D.C., Jan 1982. 42. ----------------------, Baryon Mass-ratios and Degrees of Freedom in a Compressible Radiation Flow. Contr. Paper No. 505. American Association for the Advancement of Science, Annual Meeting, Detroit, May 1983. 43. A. H. Shapiro, The Dynamics and Thermodynamics of Compressible Fluid Flow. 2 Vols. John Wiley and Sons, New York, 1953. 44. R. Courant and K. O. Friedrichs, Supersonic Flow and Shock Waves. Interscience , New York, 1948. 45. N.A. Bachall, J.P. Ostriker, S Perlmutter and P.J. Steinhardt, Science, 284, 1481, 1999. 46. A. Kamenshchick, U. Moschella and V. Pasquier, An alternative to quintessence. Phys Lett. B 511, 265, 2001. 47. N. Bilic, G.B. Tupper and R.D.Viollier. Unification of Dark Matter and Dark Energy: the Inhomogeneous Chaplygin Gas. Astrophysics, astro-ph/0111325, 2002. 48. P.P. Avelino, L.M.G. Beca, J.P.M de Carvalho, C.J.A.P. Martins and P.Pinto. Alternatives to quintessence model building. Phys. Rev. D.67 023511, 2003.